For this Nursery Theme Thursday, I had my mind set on doing a button-cute baby girl’s room – but I’m not, nor have I ever been, what you’d call a girly girl. 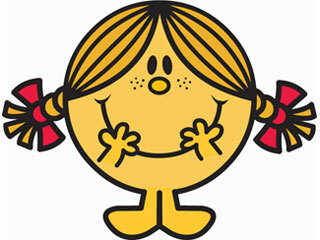 So this week’s theme, Little Miss Sunshine, is my take on a decidedly feminine (and appropriately juvenile) nursery without the frills, ribbons and bows that make me a bit nervous. Actually, this theme is inspired by neither. I could have just as easily called it Good Day Sunshine (mmm more Beatles ideas!). Or You Are My Sunshine. Or Sunshine, Lollypops and Rainbows. Or Let The Sunshine In. But this is a baby girl’s room – hence, Little Miss Sunshine. 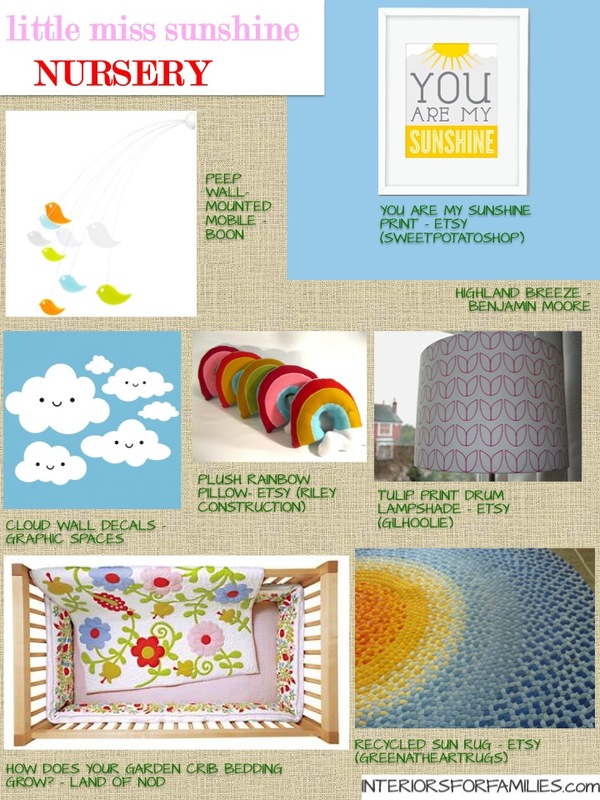 I did not think we should go too crazy with the sun, so you only see it in a couple of places – in a “You Are My Sunshine” print (sans the more melancholy lyrics), and a handmade braided rug from Etsy seller Green At Heart Rugs that evokes a brilliant sun in a clear blue sky. Instead of repeating the sun, other elements come in that you’d associate with a sunny day – birds, rainbows, flowers, etc. The cloud wall decals are inexpensive and easy, and your baby will love to look at their cute faces. They are genetically wired to be attracted to faces – cool, huh? I just love this bedding set from Land of Nod. It is feminine without being over-the-top girly. I couldn’t find a good picture without the bumpers, but please note you do not need crib bumpers and the American Academy of Pediatrics recommends against using them. I hope your Thursday is as sunny as mine promises to be; it’s a beautiful day in the Boston area! I really like this neutral theme…I agree, blue is not just for boys, especially in this theme! I like the colors and just word “sunshine” is so precious. Love the “you are my sunshine” frame! Glad you like it! Curious George sounds cute – I’ll bet your nephew would love that. You could always do the things that are more ‘disposable’ (wall decals, pillows, etc.) as character-specific so you don’t have to re-do the entire room when he grows out of it and move to something else.